Prepare the guacamole as instructed, cover, and save in the fridge until ready. Place the beef in a large bowl and cover with the taco seasoning, then mix until the two are fully incorporated. Separate the beef into 6 balls, about 1/4 lb. each, then press down gently with your hand to flatten out the patties. Add a slice of Kraft Natural Cheese about a minute or so before the burger is done to allow it to melt, then place the burger on a bottom bun prepped with a thin layer of Kraft Mayo. 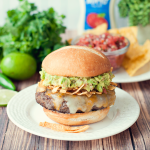 Top with a generous layer of tortilla strips and guacamole, add the top bun and eat up!